Xubuntu has a nice way of showing network data flow in the panel; put the Network Monitor in the panel and choose the network interface. I know that Gnome has a similar feature in its System Monitor http://www.thegeekstuff.com/2009/11/ubuntu-tips-graphical-monitoring-for-processes-memory-load-average-and-disk-usage/ - but is there an Xfce equivalent? Just like Network Monitor, you have System Load Monitor, this can show you the CPU, RAM and swap usage on the Xfce panel, and even the uptime. Not the answer you're looking for? Browse other questions tagged xubuntu xfce xfce-panel or ask your own question. How do I add the messaging menu to the xfce-panel 4.10? 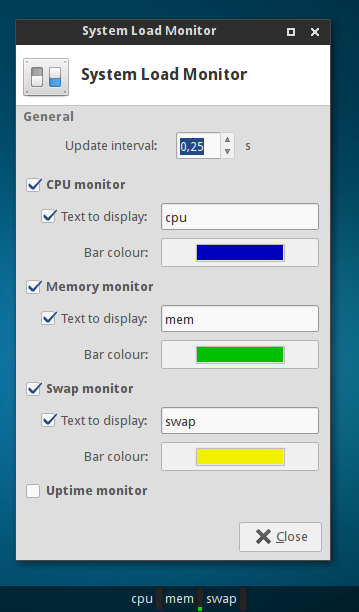 How to get the 'normal' Xubuntu/Xfce panel indicator? xfce-panel display list of windows of a single application?